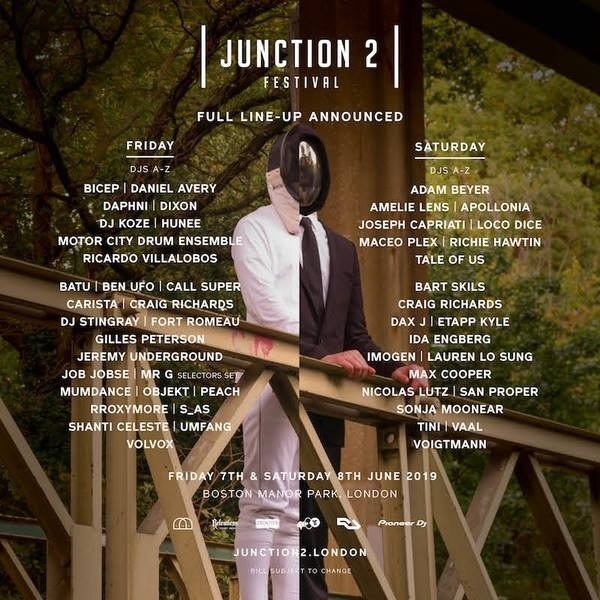 Hunee, DJ Stingray, Volvox, Giles Peterson, Amelie Lens, Max Cooper and Carista are among the acts who complete the line-up for London’s Junction 2 Festival 2019. The now two-day event in Boston Manor Park on Friday, June 7th and Saturday, June 8th has also revealed Loco Dice, Dixon, Ricardo Villalobos, Lauren Lo Sung, VAAL, Fort Romeau, Objekt, Mumdance, Batu, Bart Skils and S_As will get behind the decks. The full line-up for the Friday is Bicep, Daniel Avery, Daphni, Dixon, DJ Koze, Hunee, Motor City Drum Ensemble, Ricardo Villalobos, Batu, Ben UFO, Call Super, Carista, Craig Richards, DJ Stingray, Fort Romeau, Gilles Peterson, Jeremy Underground, Job Jobse, Mr G, Mumdance, Objekt, Peach, rRroxymore, S_As (Adam Shelton & Subb-An), Shanti Celeste, Umfang and Volvox. Saturday’s acts will be Adam Beyer, Amelie Lens, Apollonia, Joseph Capriati, Loco Dice, Maceo Plex, Richie Hawtin, Tale Of Us, Bart Skils, Craig Richards, Dax J, Etapp Kyle, Ida Engberg, Imogen, Lauren Lo Sung, Max Cooper, Nicolas Lutz, San Proper, Sonja Moonear, tINI, Voigtmann, VAAL. There will be five arenas of music including the industrial Bridge and leafy Woods. For tickets and details go to junction2.london.